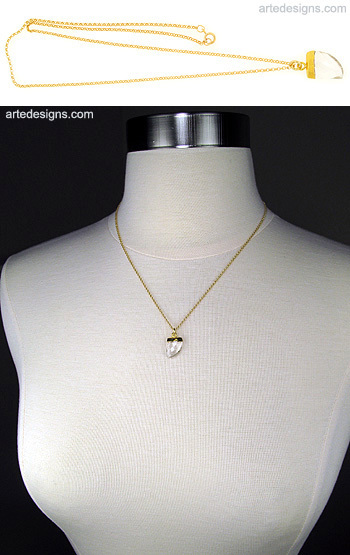 This faceted fin shaped natural crystal is electroformed with 24K gold. No two are alike. You can wear it alone or layer it with other necklaces. Crystal is considered to be a good overall health enhancer. It is good for the mind, body and spirit. It is a very powerful dispeller of negativity. It receives, activates, contains and amplifies energy. Pendant is approximately 1/2 inch high. 18 inch gold filled chain with a spring ring clasp.